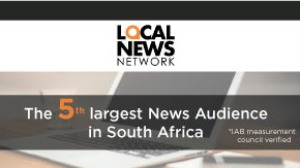 Caxton’s Local News Network (LNN) platform has been verified by the IAB Measurement Council as the fifth largest news audience in South Africa, with 2.8 million unduplicated unique browsers and over 8.8 million page views per month. The Caxton news network has over 250 journalists who aim to bring readers credible, trustworthy, breaking news. 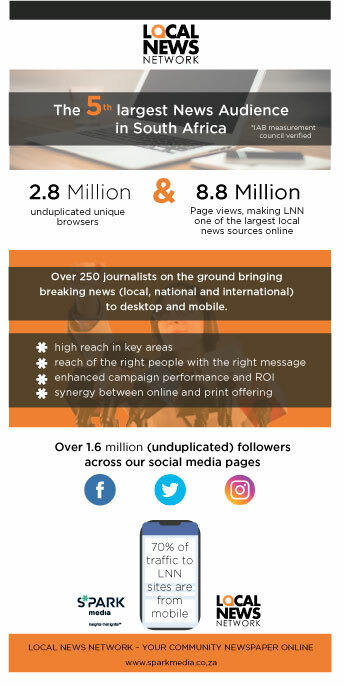 LNN comprises 82 local news websites that offer community-driven articles, advertorials, lifestyle and promotional content in a contextually relevant environment. "LNN is such a powerful platform, which offers many exposure opportunities for clients," says Marc du Plessis, joint CEO at SPARK Media. "Through our data pool and high reach on the LNN platform, we can create the perfect campaign for brands and continue to offer insights that help deliver on advertising campaign objectives." "With over 9 300 articles published per month across the platform, the array of content is vast and current, making LNN a unique, high reaching solution for advertisers," adds du Plessis. "Together with our local newspapers, LNN offers the largest hyperlocal news source in South Africa in print and online. That’s a pretty incredible promise we are proud to offer clients," du Plessis concludes. For more information, visit www.sparkmedia.co.za. You can also follow SPARK Media on Facebook.